With the end of the GDO Asia/Toys R Us exclusives, it's time to move on. Recently, a few new Transformers Prime figures have arrived in small amounts. Luckily, Jason has come through for me AGAIN and scored the newest pair, Decepticon Rumble and Sergeant Kup. 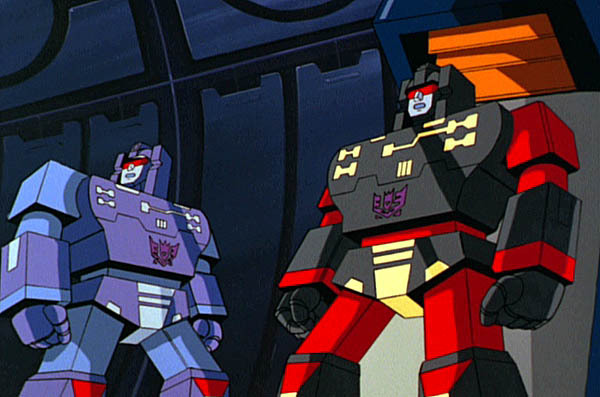 Today, we're going to check out Decepticon Rumble. Can this new Rumble shake things up like his namesake, take a look after the jump! From here on, I'm just calling him Rumble. We know he's a Decepticon, the addition of that in front of his name really isn't necessary. Copyright can be so annoying sometimes. Rumble is shown in both modes along with his Bio and a shout out to his accessories. According to our new Bio, Rumble is pretty much the same guy as the G1 counterpart after which he is named. He's a punk that likes to tear things down, and I'm good with that, to me THAT is. Rumble's Tech-spec is printed on the card that is inside the bubble and adorns the side of the it. Standard plastic tray with paper ties and instructions oragamied into the bottom. ... and to be honest, I didn't care. Even though the mold is reminiscent of Rumble's G1 form, I did't like it. Especially the pistons, they're just so small. It looks like Rumble is going to aerate my lawn, not rip a giant crevasse into it. The Transformers Prime line gives us yet another new form for Rumble; one that is also no longer an obsolete recording medium. Rumble gets upgraded to Stunticon status. Well, not really a Stunticon, but he is now the third named Decepticon in the line to get an automotive form... wait... fourth... Knockout, Breakdown, Dead End, Rumble... yeah... fourth. And it's not a bad form; but to me, still not really Rumble. Rumble's Alt-mode is incredibly plain. There are next to NO paint-apps on his Alt-mode with the exception of the black and grey car detailing and his Decepticon shields on the front and rear. The Decepticon shield is tampographed on beautifully! Rumble comes with 2 'pile-drivers'. I think they are more akin to gatling-like weapons than pistons. As you can see, they snap onto the side of his Alt-mode. Transforming Rumble to his Bot-mode is fairly intuitive. Like most car Alt-modes, the hood either makes chest, arms, or legs; in Rumble's case, legs. The whole top and rear of the Alt-mode make up Rumble's arms, shoulders, and back. Rumble's head is housed in his chest, mounted on a spring. Hinge it forward and the head flips into place... or at least it should. The top halves of the Alt-mode hinge up a little and there is a tab that allows them to 'snap' into place as Rumble's shoulders. Voila! Rumble. Rumble's Bot-mode is where we get a lot more color; mostly yellow and silver paint apps. The yellow is a bit bright. To keep with the G1 homage, I think I would have preferred gold. The chest is LOOSELY based on G1 Rumble. What looks like eyes could pass for the 'holes' in the cassette tape chest, but that's really reaching. Now... Rumble's head... his head... this is not Rumble to me. This is Bayformer Rumble. It's all stylized and triangular. It really doesn't even fit the way Prime has been representing characters. They all have mouths and are capable of emoting... except for Soundwave, but that's a character gimmick. Rumble should look the part of the punk as he's always been. Maybe a metal mohawk and visor... I mean, he's kinda like the Sid Vicious of the Transformers world... ANARCHY! For Rumble's accessories, we get his signature pile-drivers. As I mentioned earlier, these look more like quad-barreled cannons than pile-drivers. They are fairly solid until you get towards the arms, then they are hollowed out so they can fit around Rumble's forearms. Each one has the grip molded slightly off center making it flow with the contour of the arm. The only other version of Rumble that I currently own is the Perfect Effect version, the PE-01F. Yes, I know Perfect Effect meant that to be Frenzy because they are obviously of the RiRFiB frame of mind. This is not the cue to start a RiBFiR argument... I grew up primarily on the Transformers of the cartoon variety, and to me, RiB. ... segue... RiRFiB and RiBFiR refers to the ever ongoing argument based on the Transformers comics versus cartoon coloration of Rumble and Frenzy. The original G1 toys were labeled as the Red cassette being Rumble and the blue cassette being Frenzy. This was how they were portrayed in the original Marvel comics, yet the cartoon portrayed them in the opposite color scheme. 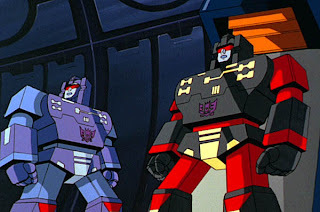 you can see a fairly accurate list of the color variations at TFWiki HERE. Ok... back to PE Rumble... I really love this little guy and his red counterpart. I think they are the prefect scale for deluxe Soundwave. AND they have a useful Alt-mode, basically being Target Masters. I have yet to pick up the Perfect Effect Laserbeak, Buzzsaw, or Ratbat. Yeah... I just don't see it happening. But again, Decepticon Rumble isn't a bad toy. If you like the character and have a huge Rumble display, then yes, pick this guy up, he's worth it. I really wanted the unreleased RTS scout version and I'd get the united one if it didn't cost the earth, I think that's a great update of G1 Rumble, perfect scrawny robot proportions, converting arms to piledrivers, and he's a tank... But alas it was not meant to be. I like this Rumble too though, he's something new that doesn't have to conform to G1 standards. I follow the cartoon's naming scheme. Plus, after playing Magic: The Gathering for so many years, I associate red with words like "frenzy." OH NO! Don't base your opinion on that picture of Scout class Rumble! That's the WORST shot of Scout Rumble ever! Lol, I have the United set, those aren't his pile drivers, those are his guns which are supposed to store on the back (like his G1 blasters) his pile drivers are folded behind his arms (can't see them in that picture) and look WAY WAY better! I know this is about RID Rumble, but seems I don't like him THAT much, I just had to get the story straight on Classics. He(they) are actually cool little bots, and are incredibly pose-able. I totally need that motivational poster! I was not aware of the pile-driver feature on the United Scouts. That's the only picture I've ever really seen for those figs. They were NEVER released in the US and the one time I did see them, Botcon 2011, the sets were going for near $200! I didn't care enough to pay near that much. I have seen closer pics of their Bot-modes... it's just something about the legs that I don't like.